Guy Clark’s classic song about an express train could be about the upcoming solar eclipse — just change the third line to “Screamin’ through America” and the title to “August — 2017!” I hope you have Monday, August 21st circled on your calendars in bright red ink. A total solar eclipse will be seen on that day by millions of people from Portland, OR to Charleston, SC. Many more millions will see a partial eclipse. The US couldn’t have a better opportunity. While totality — in which the entire solar disc is blocked by the Moon — will be viewable at any point along the path for about two minutes, some portion of the Sun will be covered by the Moon across the US (including Alaska and Hawaii), Canada, Central America, the Caribbean, and some of northern South America. The orthographic map from NASA in Figure 1 shows how much of the Sun will be covered and the approximate time. If you are one of the lucky ones, the path of totality shown by the blue line will be close enough for you to see the fully-covered solar disc. FIGURE 1. 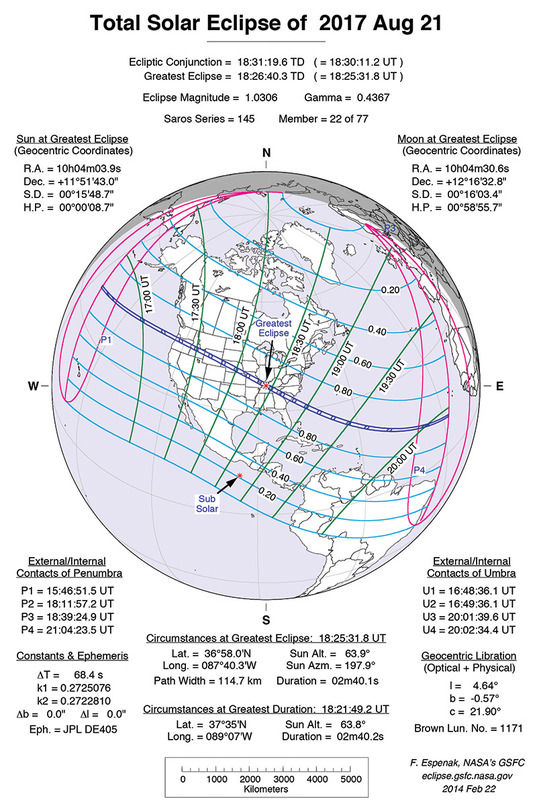 An orthographic map showing where the eclipse will be visible in the Western Hemisphere. The path of totality is the heavy blue line, with the width indicating the length of totality. The grid is labeled with the fraction of the Sun that will be covered at that location (0.2 is 20%). (Graphic courtesy of NASA. The optical effects of an eclipse are relatively obvious and well-understood. Partial solar eclipses are fairly common and lunar eclipses even more common. Not many of us have witnessed totality, but most people have seen some type of eclipse. 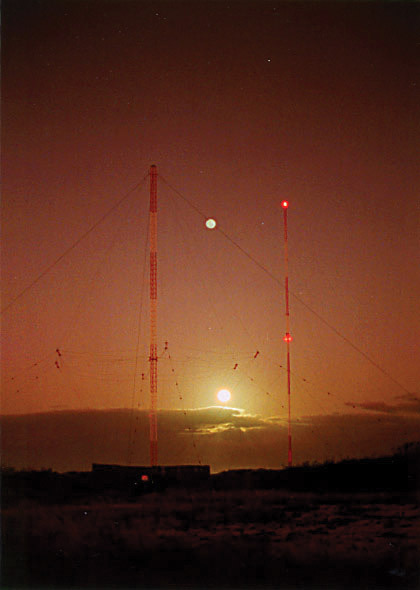 What very few people have observed is the effect an eclipse has on radio propagation. As the May and July 2016 columns explained, ultraviolet (UV) light from the Sun creates the ionosphere by giving enough energy to electrons for them to escape from the outer shells of atoms of gas; mostly oxygen and nitrogen. These free electrons and the positively-charged ions left behind can act like charges in a wire that respond to a voltage. That means the ionosphere is a very weak conductor that can affect the electromagnetic radio waves passing through it. The main effect is bending or refracting the waves in a way that returns them to the surface of the Earth. The effect is that of a reflecting surface high above the Earth — the ionosphere starts at about 30 miles up and extends to around 200-250 miles. Not every wave gets the same treatment, however. The higher the wave’s frequency, the less it is bent. Above some frequency, the wave can’t be bent enough to return and so is lost to outer space. At the other end of the spectrum, the ionosphere becomes lossier and lossier, eventually soaking up all of the signal so that none of it returns to the Earth below a certain frequency. Between these two limits, the waves are bent, channeled, guided, and otherwise pushed around. More UV during the daylight hours raises the level of ionization. This allows the ionosphere to bend higher frequency signals more, supporting long-distance “skip” of 2,500 miles or more above 10 MHz. Below 10 MHz, more UV means more absorption by the ionosphere’s lower layers. The signals never make it through to those long-distance bending layers. At night, the situation reverses. The outcome of all this wave bending is which signals we can receive depends on a variety of factors: signal frequency, season, solar and geomagnetic activity, and time of day are the most significant. The easiest things we can control and vary to see what happens to our signals are time of day and frequency. Hams have a lot of frequency choices. In fact, next to the military, amateur radio has a bigger variety of frequency bands available to it than any other service. With the new 630 meter band (476 kHz) and the 2,200 meter band (136 kHz), hams will have access to frequencies from well below the AM broadcast band to, well, light. Time of day is pretty easy to control. Assuming someone is “out there” to make a contact, you can try any band at any time. Having been at this radio business since 1906, hams like to think we understand propagation pretty well. However, there is always something new coming up. Either better equipment or protocols or science enables us to “try something different,” and there is usually something new to be discovered around every bend in the ionospheric road. The eclipse is particularly interesting this way. It is one thing for night to slowly fall as the Sun sinks below the horizon; it’s quite another for a complete day-night-day cycle to occur in three hours or less! (Totality will only last for a couple of minutes at most, but the partial phases will last up to three hours depending on how close you are to the path of totality.) 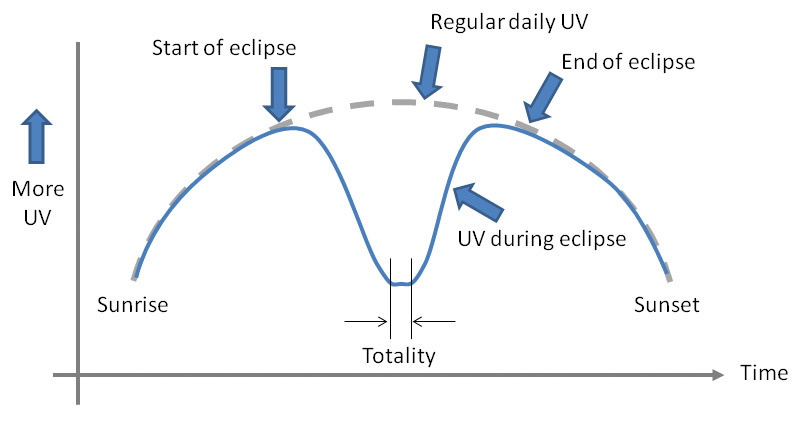 This means the solar UV will have a sudden well-defined disruption as suggested by Figure 2. FIGURE 2. A sketch of how solar UV irradition of the ionosphere will change during the eclipse. (Graphs are not to scale.) The dashed gray line shows the regular diurnal (daily) variation in UV exposure. We know from past experience that a total eclipse of the Sun does have a big impact on ionospheric radio propagation. The eclipse duration will be long enough for those separated electrons and ions to find each other again — a process called recombination — and we’ll have nighttime propagation. Bending on the higher frequency bands will fade and the signals will zip off into space — those bands will “close” to long-distance propagation. Simultaneously, absorption at the lower frequency bands will disappear and those bands will “open.” At the end of the eclipse, the reverse happens, and aside from some very confused electrons, things will be back to whatever normal conditions were before the eclipse. Everybody in the United States will get some view of the eclipse, depending on cloud cover. If you are fortunate enough to be “on the line” of totality, you’ll get the maximum length experience: almost three hours from the time at which the lunar disc first begins to cover the Sun, until it is clear of the Sun again. Totality will last two minutes and 40 seconds at maximum, near Carbondale, IL. For some idea of how long the eclipse will last at your location, try the web page at www.space.com/36388-total-solar-eclipse-2017-duration.html. What are the Hams Doing? As you might imagine, this level of change coupled with a major solar event has the ham radio community pretty excited. Hams already can hear the world turning as the daily ebb and flow of UV opens and closes different bands and different paths. It’s a relatively slow process, taking minutes to hours. The opportunity to experience changes occurring so quickly you can hear them is another thing entirely. So, what are we doing about it? We’re throwing a party! Actually, it’s going to be a “QSO Party” (pronounced “kyew-so” which means “contact”) in which hams make short contacts as quickly as possible on as many bands as possible throughout the event. The bands will come to life in the morning and fill with signals throughout the day. 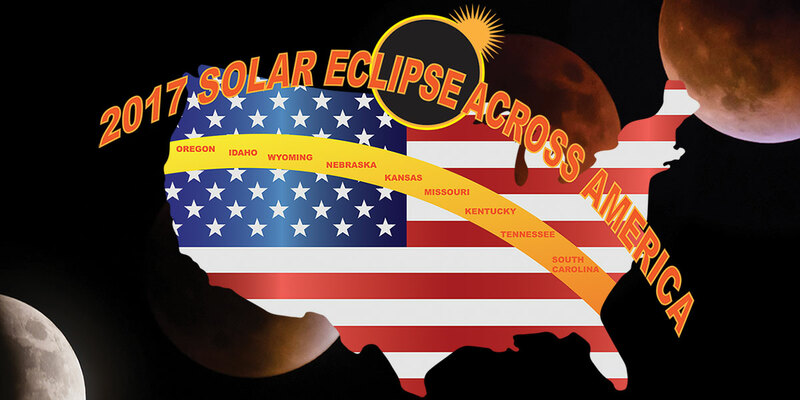 The Solar Eclipse QSO Party (SEQP) will be one of the premier ham radio events of the year! See the HamSCI SEQP web page for complete rules and FAQ. Time and Date: Monday, 21 Aug 2017 from 1400-2200 UTC. Bands: 160, 80, 40, 20, 15, 10, and 6 meter bands (1.8 through 50 MHz). Modes: CW, PSK31, RTTY will be decoded and logged. Categories: Single-operator or multi-operator team. Exchange: Send the call sign of sending and receiving stations, signal report, and six-character grid locator (e.g., EM48ss). Not only will hams be making contacts, but they will be collecting data at the same time. We’ll be making use of two recent ham radio innovations: automated receiving decoders and data logging networks. The decoders — popularly referred to as “skimmers” after the CW Skimmer software written by Alex Shovkoplyas VE3NEA (www.dxatlas.com/cwskimmer) — can receive Morse code (CW) and radioteletype (RTTY) signals, extract the call sign, and — most importantly for the SEQP — measure the signal-to-noise ratio (SNR). Other decoders can do the same for WSPR and PSK signals. Decoders will be deployed at dozens of sites around the world on all of the active amateur bands, listening especially hard at 50 MHz and below — frequencies expected to be most strongly affected by the eclipse. The decoders will then relay their observations to mapping and reporting services such as the Reverse Beacon Net (reversebeacon.net), PSKReporter (pskreporter.info), and WSPRNet (wsprnet.org) which will store each and every observation. Hams will exchange a short message indicating received signal strength and exact location as a six-character Maidenhead grid location, such as EM48ss (the author’s home locator). (You can learn more about the grid system at en.wikipedia.org/wiki/Maidenhead_Locator_System.) Hams will keep their own “log” as well, with a list of all the contacts they’ve made. Take a look at Figure 3. Then what? That’s where the professional researchers come in! There is no way even teams of pros could duplicate the many thousands of amateur stations, so they’ve decided to use the ham-generated data themselves. All of the decoder readings and all of the logs will be collected by a group of Virginia Tech faculty and staff led by Bob McGwier N4HY. They will turn all that data into a database that geophysics researchers can use. What do the hams get out of it? First, hams like making a lot of contacts and this will be a lot of fun. At the peak, individual stations may make several quick contacts every minute. Over the eight hours of the SEQP (see the sidebar), some stations will log more than 1,000 QSOs (contacts). In recent years, researchers using the HAARP facility in Alaska and elsewhere have discovered hams as an enthusiastic knowledgeable community willing and able to help conduct worldwide experiments. The early “Listening Tests” were coordinated by the Naval Research Lab (the DARPA of its day). Today’s SEQP is being coordinated by HamSCI (hamsci.org): an informal team of faculty, graduate, and undergraduate researchers at a variety of academic institutions. HamSCI stands for Ham Radio Science Citizen Investigation. Its mission is to coordinate and promote a variety of scientific projects involving ham radio. The initial focus was on the eclipse — what could hams do to promote the science associated with it? Once the SEQP had been devised, it became apparent that there were many other opportunities. A number of organizations were all working on their own projects, too. So, the idea of a platform to connect all these people and projects was born. Check out the various projects on the website. You’ll be impressed. Assuming you’re not (yet) a ham, what can you do to observe the eclipse from the standpoint of radio? First, you might check with local ham clubs and see if any of them or their members are planning to operate during the eclipse — either as part of the SEQP or in some other way. You would probably be welcome as an observer. 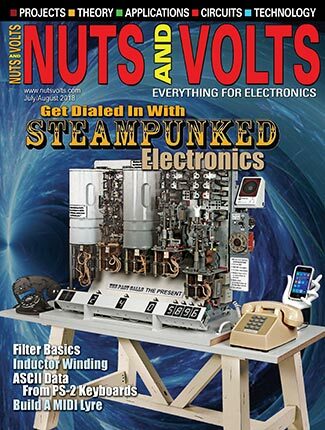 What a great way to get a look at ham radio in a new and interesting way! Remember how solar UV causes the ionosphere to absorb low frequency signals during the day but reflect them at night? That is exactly what happens to AM broadcast signals, and it’s the reason you can receive distant AM stations after sunset that you can’t hear at all through the day. Your experiment will be to see if you can receive distant stations during the eclipse and for how long. Before the eclipse begins, listen for these stations at night on a good quality radio — preferably with a piece of wire attached to the antenna terminal. Find a few you can hear well and write down their frequencies. These are your beacons. During the eclipse, tune from one station to another and note whether you can hear them and how strong they are at different times. What you’re looking for are stations that approach their nighttime signal during the eclipse and then fade again as it passes. 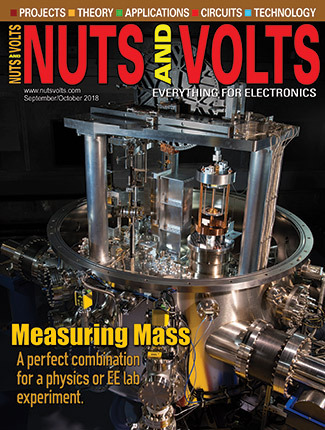 If you have a “world band” radio — meaning that it can tune to the shortwave bands — you can do the same experiment with the National Institute of Standards time-and-frequency station WWV (https://en.wikipedia.org/wiki/WWV_(radio_station)). WWV is in Fort Collins, CO and transmits on 2.5, 5, 10, 15, and 20 MHz. (You may also hear WWVH on 5, 10, and 15 MHz — it is located in Hawaii on the island of Kauai and beams its signal primarily west into the Pacific.) A world band radio may also have an “S meter” which gives a reading of signal strength. You can log those readings as the signal is received. Refer to Figure 4. Find the highest frequency signal from WWV you can receive at about the same time — midday or later in the afternoon. Note its signal strength. Monitor that frequency during the eclipse and see if you can observe the opposite effect from the AM stations. WWV should fade as the path between it and your location is darkened and the ionosphere grows weaker. If you are within a couple hundred miles of WWV, you are probably too close for “skip” reception. Try receiving the Canadian standard station CHU on 3330 kHz, 7850 kHz, or 14670 kHz. Finally, you can try to measure the Maximum Useable Frequency (or MUF) from your location by listening to shortwave broadcast stations at different frequencies. 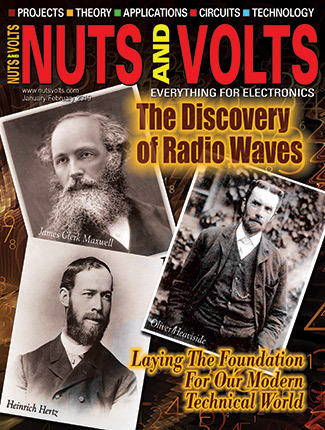 The best reference for finding frequencies is the World Radio TV Handbook (www.wrth.com). 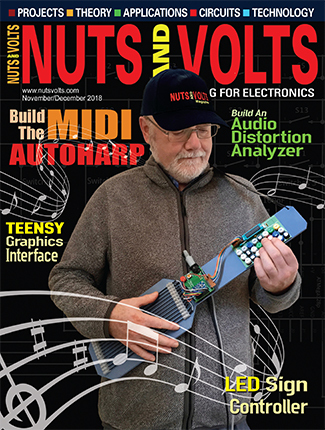 Copies are available online, but get a recent edition since broadcasters may change frequencies and schedules. The national stations are usually the strongest. Find a couple that you can receive well on non-eclipse days at the same time of the eclipse. Don’t forget the hams will be busy operating, too. If your radio can receive “SSB,” then it can also receive CW and RTTY signals. Monitor signal strength as the shadow passes by, and tune to higher and higher frequencies until the signals fade — that’s just above the MUF between your location and that of the sending station. After the Eclipse, Then What?